Before the new system goes live, from December 12 at 5:00 p.m. to December 17 at 9:00 a.m. PittSource will have an outage period to move information over to Talent Center. During this time, PittSource will be unavailable to users, OHR, and the public. There are several steps that responsibility centers and departments can engage in to better prepare for the outage, launch, and transition to the new system. Please submit these PittSource transactions by the deadline your final approvers have set (prior to December 12) in order to be processed by compensation and talent acquisition before the system is unavailable. Don’t fret, if you don’t get updated or new requisitions submitted before the outage, they will be there for you once the system is up and running on December 17. Unfortunately, requisitions with or without updates and hiring proposals will not convert to Talent Center if they are not submitted before the deadline. Please prioritize which requests need to be submitted. All submissions for employee start dates of January 2 or before should be prioritized. The Office of Human Resources will also prioritize actions as requests come in for start dates between December 17 and January 2. For later start dates, please wait to perform any actions until Talent Center is available on December 17. Once Talent Center is live, all users will begin in Talent Center and will automatically be routed to the correct destinations to complete tasks. Also after launch, the approval workflow will change and improve. The requisition workflow reflects the steps, approvals, roles and integrations/systems involved in each requisition process. For the December 2018 launch, PittSource will exist in an interim state with Talent Center. Any actions done in PittSource will automatically be updated in Talent Center. How will the two systems work together? For the December launch, PittSource will exist in an interim state with Talent Center. The two systems will work together to provide a seamless process for all recruiting and hiring actions. For now, PittSource will house all job descriptions and Talent Center will be where users start and end talent acquisition actions. More details on how the two systems will work together can be found on the Talent Center page. The December 17 Talent Center Launch will impact those who are involved in the hiring process of staff, students, and temporary employees. Will applicants be able to apply during the outage? No. 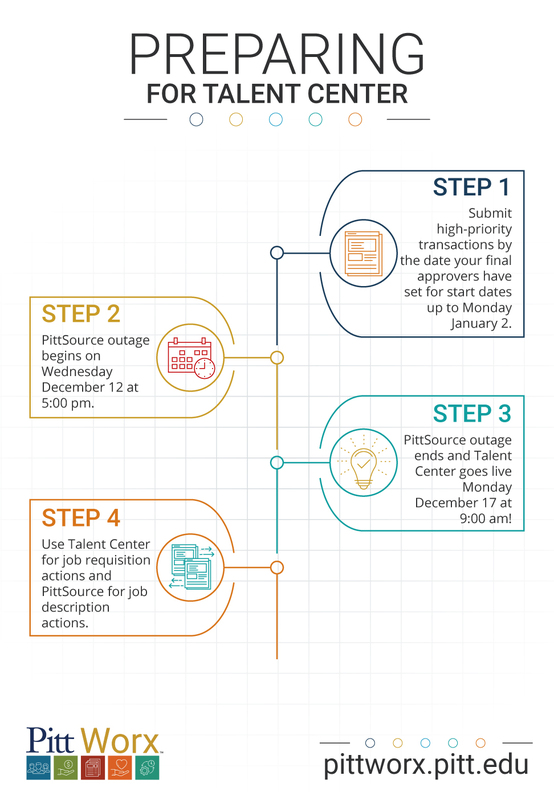 During the December 12-17 outage, no one, including applicants will have access to PittSource. Once Talent Center is launched, applicants will be directed to a brand new applicant site, join.pitt.edu. What if I don't get my posting and offer requests to my final approver before the outage? If you don’t get updated or new requisitions submitted before the outage, don't fret. They will be there for you once the system is up and running on December 17. Unfortunately, requisitions with or without updates and hiring proposals will not convert to Talent Center if they are not submitted before the deadline. Our Pitt Worx Talent Center team will be monitoring pending requests before the outage and will work with departments as needed before December 12.